Welcome to the Sorcerer Sound Home Page! 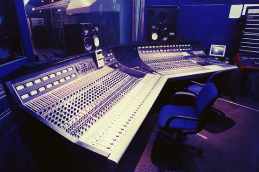 Our focus is on live recording. We feature big rooms with high ceilings and professionally designed acoustics. We have over 100 microphones in our collection, including many vintage tube mics. Each of our Control Rooms features Neve and Studer equipment along with a generous assortment of outboard gear. 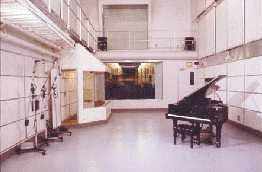 We have some great instruments and amps, including a Steinway B Grand Piano in each of our studios. Perhaps most importantly, we have expert on-site maintenance to make sure that all of our gear stays in top condition. What's more, we encourage you to experiment by including practically all of our equipment in the basic studio rate. In the other pages in our site you'll find detailed descriptions of Studio A (our smaller room) and Studio B (our larger room), equipment lists and even some articles we've written to help musicians learn more about studio equipment and the recording process. Or you can skip right to our Photo Tours of Studio B and Studio A. Have fun browsing and visit us again. We'll be adding more to this site in the near future. Web Design Note: We have attempted to make our site interesting, informative and user friendly. All the information in this site is accessible with or without frames and tables. Users of text-only browsers and those who keep images off can similarly access all of our content, with the exception of pictures of the studio. We cannot of course try our pages on every browser, so we welcome your feedback.